This Northern Industrial 71-Pc. 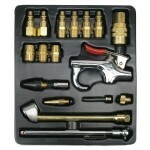 Air Tool Kit includes a 3/8 in. ratchet wrench with 8-pc. socket set, a 1/2 in. 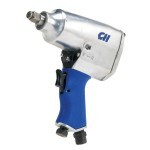 impact wrench, 1/4 in. 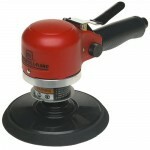 die grinder, a 150mm air hammer with round chisel set. 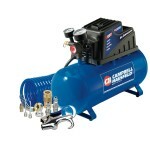 Also includes a 10-pc. 25mm bit set, 10-pc. shank stone set, 5-pc. 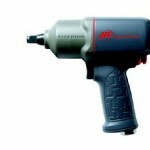 sanding paper set, plus hand wrenches, polish wheel, blow gun, hex key, adapters, nozzles and other accessories, all stored in a blow-molded case. W x 3.75” D.